The average apartment price across the country has risen by 20% over the past year, say market experts. This means your home will cost 10 to 15 % more, based on a 1.5 to 2 percentage point increase in interest rates on your EMIs. A home loan rate of 11%, up from 9.5% a year ago, implies a 15% jump in the EMI ­ and the net impact on your property price may be around 35%, taking into account the EMI load. Floating rate loans may eventually see a decline in EMIs, but only if lenders pass on any cost reduction to customers. Experts say that if your horizon of buying a home is for five to 10 years, a rented home may be a good idea. “It takes care of uncertainties surrounding EMIs, rising interest rates, high property prices and your cash-flow issues,“ said Lovaii Navlakhi, managing director at International Money Matters, a financial advisory firm. “If you are in a city only for few years renting is the way to live,“ added Vishal Dhawan, a Mumbaibased financial planner. However, if you are looking at your first property and stay in it yourself for 10 years, experts concur that buyers should go right ahead. “It is not a transparent market and you don't know if the real estate prices fall, by how much and over what time,“ said Surya Bhatia, a Delhi-based financial planner. But do watch some basic rules, experts say. Do not “over-leverage“ to stretch your borrowings, and keep EMIs in a comfortable limit. The thumb rule is that the total EMIs you pay should not exceed 40 to 45% of your household income. Experts are unanimous that the current market is not for investment as prices might even fall. “Broadly, residential real estate prices will see a moderate growth of 5-10%, as developers continue to liquidate their stocks,“ said Anuj Puri, country head at property consulting firm Jones Lang LaSalle India. 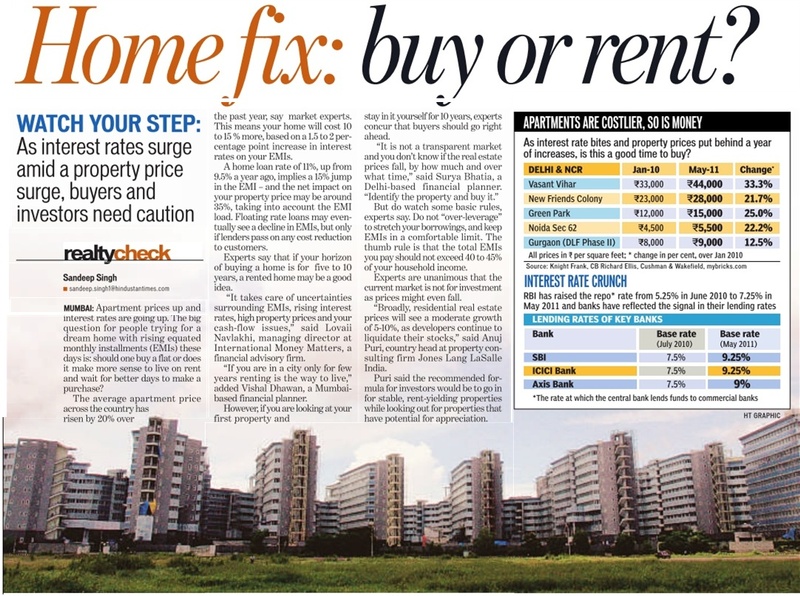 Puri said the recommended formula for investors would be to go in for stable, rent-yielding properties while looking out for properties that have potential for appreciation.